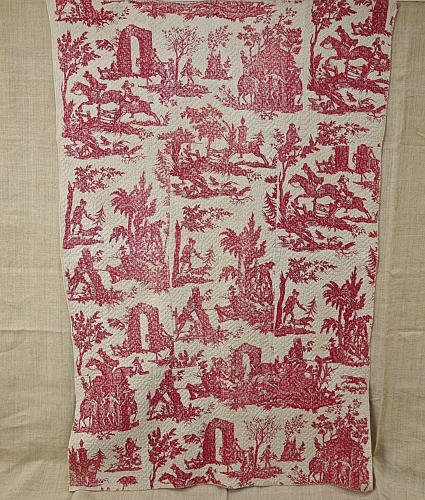 A rarely seen French Toile de Nantes called ‘La Chasse du Sanglier or ‘Thae Boar Hunt’ fromthe Favre Petitpierre et Cie factory.There are scenes with falcons,horses jumping and some ladies and gentlemen.A soft raspberry red colour, it is small and densely quilted and backed in a plain linen. The middle section is made up of three joined pieces going across. Some fading to the side and center with discolouration in places on the white ground.